Captain Ros Poplar, USN, a native of Havre de Grace, Maryland, graduated from the University of Mississippi in 1974. He served in USS LEAHY (DLG 16) as Gunnery Assistant, ASW Officer and Navigator, and participated in the historic US/USSR ship exchange visit (Leningrad) in 1971. Upon completion of this initial sea tour, he reported to Vanderbilt University as an NROTC Instructor. After receiving a Master of Science degree in Industrial Engineering, Captain Poplar reported as the commissioning Operations Officer in USS LEWIS B. PULLER (FFG 23). He then served as First Lieutenant in USS ANCHORAGE (LSD 36). Both ships were Battle “E” winners, and USS ANCHORAGE received the prestigious Arleigh Burke Award during his assignment. Upon completion of department head tours, he was selected as Flag Secretary for Commander Framing Command, U.S. Pacific Fleet. He then served as Executive Officer in USS WADDELL (DDG 24) and deployed with Battle Group “Bravo” to the North Arabian Sea and Arabian Gulf. He subsequently attended the Army War College at Carlisle Barracks and served with the Joint Special Operations Command (JSOC), Fort Bragg, North Carolina. During Operation DESERT STORM he was a member of the Joint Special Operations Task Force (JSOTF) which conducted missions directed by the National Command Authority. Captain Poplar assumed command of USS RUSHMORE (LSD 47) in January 1993 off Green Beach, Mogadishu, Somalia. 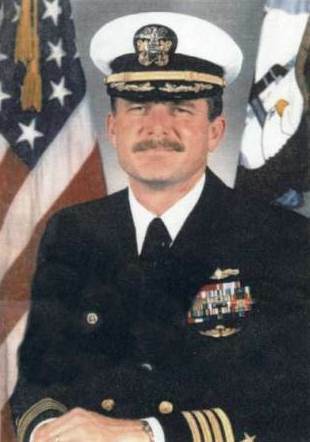 During his command, RUSHMORE earned the Joint Meritorious Unit Award, Navy Unit Commendation, Meritorious Unit Commendation, the Chief of Naval Operations Surface Safety Award, the Commander, Naval Surface Forces, Pacific, Self Sufficient Ship Award, and the Commander, Naval Base San Diego, Community Service Award. RUSHMORE deployed twice and participated in Operations SOUTHERN WATCH, RESTORE HOPE, SUPPORT HOPE, DISTANT RUNNER, and VIGILANT WARRIOR. Captain Poplar was subsequently assigned on the OPNAV staff as Branch Head for Warfare Policy (N512). Captain Poplar assumed command of USS MOUNT WHITNEY in July 1997 and worked her up for MOUNT WHITNEY’s first deployment in 28 years. His personal awards include the Legion of Merit (two awards), Defense Meritorious Service Medal, Meritorious Service Medal (two awards), Joint Commendation Medal, Navy Commendation Medal (two awards), and Navy Achievement Medal (three awards). He also wears the Navy and Marine Corps Parachutist Device. Captain Poplar is a Joint Specialty Officer, a manpower, personnel, and training sub-specialist, a strategic planning sub-specialist and a C4I sub-specialist. He is also a graduate of the Armed Forces Staff College. Captain Poplar is married to the former Helene Arlantico of San Diego. They have three children – Steve, Brenda, and Eric.